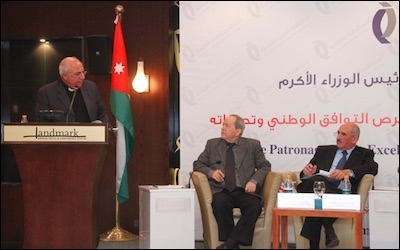 Dr. Hanna Kildani (left) told a conference in Amman in February that "there is a complete cancelation of Arab Christian history in the pre-Islamic era" in Jordan's educational curriculum. Of course, Christian minorities throughout the Middle East—not just in Jordan—have long maintained that the history taught in public classrooms habitually suppresses the region's Christian heritage while magnifying (including by lying about) Islam. For generations, Muslim students have been indoctrinated to see Christians as a non-organic remnant of Western colonialism. Zara might be surprised to learn that similar ignorance and historical revisionism predominates in the West. Although Christians are in fact the most indigenous inhabitants of most of the Arab world, I am often asked, by educated people, why Christians "choose" to go and live in the Middle East among Muslims, if the latter treat them badly. At any rate, the Mideast's pseudo historical approach to Christianity has for generations successfully indoctrinated Muslim students to suspect and hate Christianity, which is regularly seen as a non-organic parasitic remnant left by Western colonialists (though as mentioned, Christianity precedes Islam in the region by some six centuries). This also explains one of Islam's bitterest ironies: a great many of today's Middle East Christians are being persecuted by Muslims — including of the ISIS variety — whose own ancestors were persecuted Christians who converted to Islam to end their suffering. In other words, Muslim descendants of persecuted Christians are today slaughtering their Christian cousins. Christians are seen as "foreign traitors" in part because many Muslims do not know of their own Christian ancestry. Due to such entrenched revisionism, Muslim "scholars" are able to disseminate highly dubious and ahistorical theses, as seen in Dr. Fadel Soliman's 2011 book, Copts: Muslims Before Muhammad. It claims that, at the time of the Muslim conquest of Egypt, the vast majority of Egyptians were not, as Muslim and Western history has long taught, Christians, but rather prototypical Muslims, or muwahidin, who were being oppressed by European Christians: hence, the Islamic invasion of Egypt was really about "liberating" fellow Muslims. Needless to say, no real historian has ever suggested that Muslims invaded Egypt to liberate "proto-Muslims." 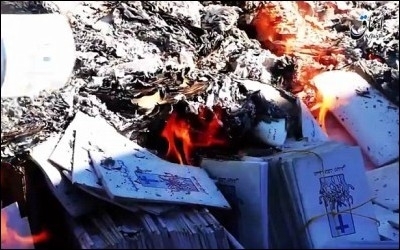 Rather, the Muslim chroniclers who wrote our primary sources on Islam, candidly and refreshingly present the "openings" as they were—conquests, replete with massacres, enslavement, and displacement of Christians and the destruction of thousands of churches. [i] Quote from The Last Supper: The Plight of Christians in Arab Lands by Klaus Wivel.